Perseids • Celestial event brings brightest light show of the year. Petros Giannakouris | The Associated Press In this photo taken with long shutter speed, a meteor sparks while entering the earth's atmosphere behind an olive tree during the Perseids Meteor Shower, in Fanos village, central Greece, on Saturday. The Perseids are a prolific meteor shower associated with the comet Swift-Tuttle. The Perseids shower is visible from mid-July each year, with the peak in activity being between Aug. 9 and 14 depending on the particular location of the stream. When John Denver sang about seeing it rain fire in the sky in the Rocky Mountains, he was referencing the Perseid meteor shower, which will grace the skies through the weekend, peaking on the night of Aug. 12. The Perseids, the meteoroids of which come from a trail left by the Swift-Tuttle comet, generally produce one of the best meteor showers of the year, and often produce the most fireballs  the meteors that are as bright as the planets Jupiter and Venus, according to Bill Cooke of NASA&apos;s Meteoroid Environment Office. "Get away from city lights," Cooke said. "While fireballs can be seen from urban areas, the much greater number of faint Perseids is visible only from the countryside." 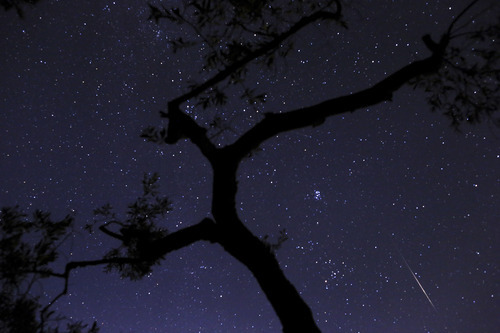 However, meteor showers can be fickle, and even frequent producers such as the Perseids require patience, cautions Patrick Wiggins, NASA solar system ambassador to Utah. "Even a really good meteor shower has one or maybe two meteors a minute," Wiggins said. "And some of those might be a faint wisp and some of those might be a giant fireball. But don&apos;t go out and just spend 15 minutes. Spend at least an hour watching the sky." The best times to watch are between midnight and dawn, and viewers can look at the northern half of the sky, but there isn&apos;t one particular area to watch, Wiggins said. Wiggins also emphasized the importance of getting out of the city light pollution and heading out to the salt flats or up Emigration Canyon. Clouds should lighten up on Saturday and Sunday nights, said Mike Conger, meteorologist for the National Weather Service, but visibility on Monday and Tuesday could be difficult. All the more reason to grab some friends, some snacks and a few comfy lawn chairs and blankets this weekend, Wiggins said. "Make it a party, and remember  location, location, location," Wiggins said.